Loyalty, like empathy and honour, is a matter of high virtue. It is reasonable, logical, and virtuous to be loyal to your friends and family. Loyalty is also normally extended to one’s family in its wider sense; in support of community, nation, and civilisation. It is a natural part of the human condition. Having a sense of loyalty to one’s own does not imply any judgment, dislike, or animosity directed against others; it simply entails a wish to look after those who are close to one’s heart. In today’s climate of globalism, multiculturalism, and political correctness, in concert with the pushing of anti-nationalism and rampant anti-traditionalism, it is more important than ever to declare loyalty to one’s nation, culture, and way of life. For those who are part of the family of Western nations, brought together under the umbrella of Western Civilisation, it is especially important to ensure the survival of one’s nation and culture, as well as to defend the underlying shared heritage and traditions of the White Western nations. The West is facing a prolonged and sustained attack, one which threatens the very existence of our civilisation, and which may very well result in the destruction of all Western peoples in the span of just a few generations. However, all is not lost. There is a growing groundswell of people who are waking up to the dangers that face the West, and who are realizing that there is a need to fight for the future existence of their people and their way of life, not just for themselves, but to preserve those important elements for the generations to come. It is worthwhile to consider an important question: What is really the driving force behind those who seek to ensure the preservation of their own people, to enable the survival of their own race, and to safeguard the continuance of their civilisation? The answer is loyalty. Loyalty to one’s nation, race, and civilisation. Normal people have a natural and emotional attachment to their own kind, and they will therefore want to defend their own people. Those loyal to their nation have commonly described themselves as nationalists, patriots, preservationists, or traditionalists (and there are also pan-European internationalists); the same people are commonly described by their enemies as conservatives, racists, or reactionaries. “Loyalist” may well be considered to be a better descriptive term for those people who seek to defend their people. 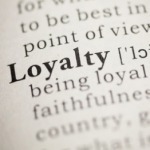 Unlike some descriptors, “Loyalist” is a positive word, encapsulating many good aspects of human behaviour. The term “Loyalist” can be appropriately applied to those for whom loyalty to their people is paramount. Of course, like most words, the word “Loyalist” has previously been used in other contexts; it was used during the time of the American Revolution in the late 1700s, as well as widely used regarding the troubled times in Ireland in the 1970s. However, those times are past, and our cause is much more important than the passing tribulations of any state. The existence of the entire family of Western nations is at stake. We are fighting for the very survival of our people. This is a cause which is far more important than any other in the history of mankind; for if our own people cease to exist then little else matters. Modern-day Loyalists strive to defend not only their nation, but also both the ideals and actuality of Western Civilisation. We face the most important task ever to face modern mankind. We fight for our very existence. For those who are loyal to their people, their nation, and their race, this is the time to step forward and be counted. In an era of globalism and treachery, we need those who will be loyal to the future of our people. The soul of Western Civilisation cries out for those who will rise to the defence of the West. For those who are willing and able to be counted as Loyalists, your time has come!